So it is officially Autumn and I am absolutely loving it! I am hands down one for the colder mornings, getting up and putting on my thick, fluffy dressing gown while slowly going downstairs to make myself a cuppa in my old granny slippers, I mean; how cosy does that sound? Trust me, it's cosy! I thought it would be a lovely feel to my blog to add in what I truly love most about Autumn, so you can enjoy each of these as much as I do. 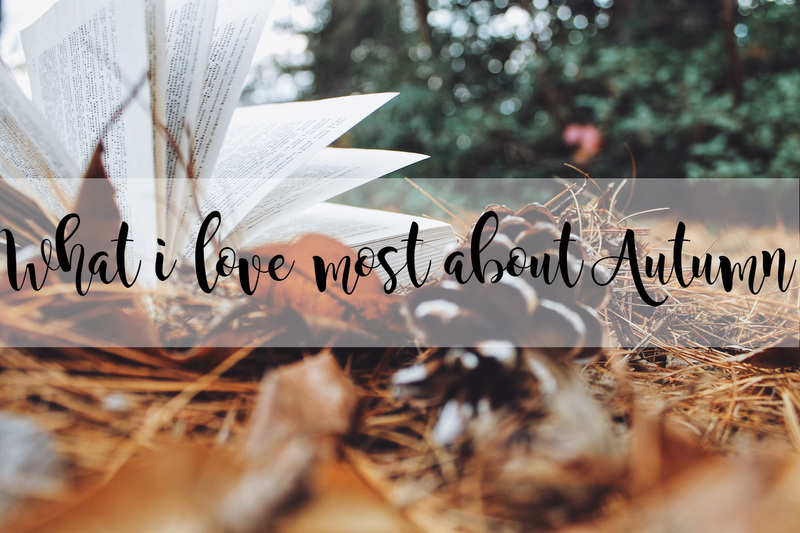 I absolutely love reading about Autumn as it makes me more excited for it as each day comes, and I hope you feel the same way too after reading this! For some reason Autumn has a really beautiful smell, and I'm not too sure what this smell is. However, when you go out the air smells a lot more fresh, there's a scent which comes from the leaves and it just smells like Autumn. I'm rubbish with descriptions but you know exactly what I mean! The smell inside my house during Autumn is also beautiful because I have candles lit, I bake more and it just smells like bakers heaven! Love it. So, it's too hot to make a homemade beef strew throughout the Summer, especially when the oven has to be on for a good three or four hours. We leave beef stews for the colder months and I cannot wait for it to be cold enough to have the oven on for three hours. I love dumplings, there's no doubt about it! How soft the beef is when it melt in your mouth and all the veggies that go with it. I could easily eat one every day throughout Autumn, they are beautiful! I would rather have a woollen jumper or scarf than anything else! I love when my mum knits me cardigans or scarves for the colder months as they're much more soft and cuddly and she can make them to my taste. I am currently living in my university zipped hoodie as it's not quite cold enough for my woollen cardigans and jumpers yet but soon, it will be and you will never see me leave them! I love feeling cosy all year round and Autumn is the best time of the year to feel cosy in what you wear. So I've just mentioned how much I love woollen scarves and to be honest, I love any scarves. If I had to make a list of what I had most of it would go; Pyjamas, fluffy socks and then scarves. Can you tell I love feeling cosy? I have bought three scarves this year already, and it's only just Autumn and I don't want to stop either. My favourite scarves are the blanket ones which you can fold and then wrap round you or you can use it as a blanket when you're cold in the car while stuck in traffic! I can't be the only one who does this.. Still on the line of cosyness, winter quilts and blankets! I love blankets! Anything fluffy, warm and cosy which I can wrap over me is good enough for me! Right now I still have my summer quilt on which makes me quite sad as it's still rather warm, but I will soon be transferring over to my thicker quilts and my warm, cosy throws! When I'm at home, I tend to stay in bed all day doing anything which needs doing (blogging, editing pictures or uni work), so I can still lay under my duvet. If I'm not in bed, I'll be lounging on the sofa, still underneath a blanket! It's where I'm most comfortable and how I feel relaxed when I'm at home. I also love listening to the rain, this is an all year round sort of thing here in the UK, we always have rain! But, when it's dark and gloomy and it's hammering it down with rain and you're cosy in bed, it's such an amazing feeling and I find it very therapeutic. When I'm feeling down and I know it's raining outside, I tend to drive somewhere where no one else is around so I can sit in my car, listen to it and relax. It works, trust me! I have finally managed to encourage my boyfriend to light candles when I'm not around! He now loves them just as much as I do. I was never allowed to have candles when I was in school, because I would be that clumsy person who leaves a candle lit and then leaves the house. You can imagine what would happen next and that is exactly why I didn't have them! I now really enjoy lighting my Autumnal candles with all the spices when it's dark. It means I don't need to have a lamp on, and I can fill my bedroom with amazing scents too! I love the colours in Autumn, but I never used too which I find really strange. Who doesn't like the colours in Autumn?! After realising I can still wear a dark nail even though I'm ridiculously pale, I will find the darkest colours to wear in Autumn on my nails and embrace the darkness of each day! I love the black cherry shades, black, greys, dark greens/blue/purples and the coppery orange, they're so stunning and my nails will always show my personality! I also love how beautiful everything is outside. The leaves change from colour to colour and then start to crisp, and this is when they're most beautiful! I actually really do not like green leaves, I just think it's standard and boring! I also love how the fashion changes. Say goodbye to the pastel, pale shades and bring out the dark greens, purples, mustard and reds! How many times have I mentioned pyjamas in this post so far? It's time to dedicate a whole point to them! Pyjamas are my life. They are life. I live in my pyjamas. If I'm staying at home all day, instead of wearing lounge wear, I will wear pyjamas. If I'm out for the day and get home, I will get changed straight into my pyjamas before doing anything. If I have been on a long journey too in a car, I will also make sure I take some pyjamas bottoms with me, so I can change for the journey home! I just love them, they're comfortable, soft, cosy and I don't have to worry about my stomach hurting from wearing jeans or anything tight against my stomach throughout the day! If you haven't hinted from my blog already, I also love baking and I love it more in Autumn. I am specially loving October for baking as I have so many recipes planned for Halloween and the Autumnal months! My favourite ingredient to put into recipes will always be spices, anything with ginger, cinnamon or nutmeg! They're my favourites. If you like baking too, make sure to follow me on Bloglovin where you can stay up too date with all of my baking posts! While laying in bed or on the sofa in my cosy pyjamas and my fluffy socks and blankets, I do love to watch a movie or something good on Netflix! I have so so many DVDs it's crazy. I would much prefer to watch a movie, than watch anything on Sky, purely because there's hardly ever anything good on Sky and I find the programmes fairly boring! There are so many good tv series coming out on Netflix too throughout Autumn and I cannot wait to start watching them! Last but not least is dark makeup. So, I'm pale, we know this. However, sometimes being adventurous with makeup can be quite difficult especially when you're pale and you're worried you won't be able to pull off the darker shades. After watching MyPaleSkin on Youtube (If you don't know who she is, you need to Youtube her right now), I know I need to start being more adventurous with my makeup and use the darker lips and eyeshadow's. They're so beautiful and I love seeing everyone's tutorials on them, I just need to be pushed to try them for myself! Aw I love this post! I actually posted one similar to this on my blog. I couldn't agree with you more with movie nights and baking, can't wait to see what the next few months bring!